Icmeler Turkish Night is reserved for those of you who like belly dancing, folk music, traditional Turkish food and delicious home made wines. Basically, for those of you who would like to learn more about Turkish culture by experiencing an authentic Turkish night. Icmeler Turkish Night is a wonderful presentation of traditional Turkish dances and ceremonies, artists who perform in beautiful costumes, as well as numerous charming Turkish customs. These live shows also offer a chance to participate, for those exhibitionists among you. If you like a good dare, Icmeler Turkish Night will gladly give you one. Belly dance is well known around the world as a dance form connected to oriental vibes. Belly dancers within Icmeler Turkish Night are very seductive and this is the show you will remember for the rest of your life. Their costumes are colorful and gloss and glitz are their main feature, and there is also that mesmerizing sound that coins around their hips make while they move. All food and drinks are included in the price, and you are allowed to enjoy unlimited amounts of wine, some delightful local beer, as well an array of soft drinks. Turkish gourmet specialties, as well as their delightful sweets such as locum and baklava, are well known around the globe, and you will have the chance to taste them all in an authentic Turkish ambience. 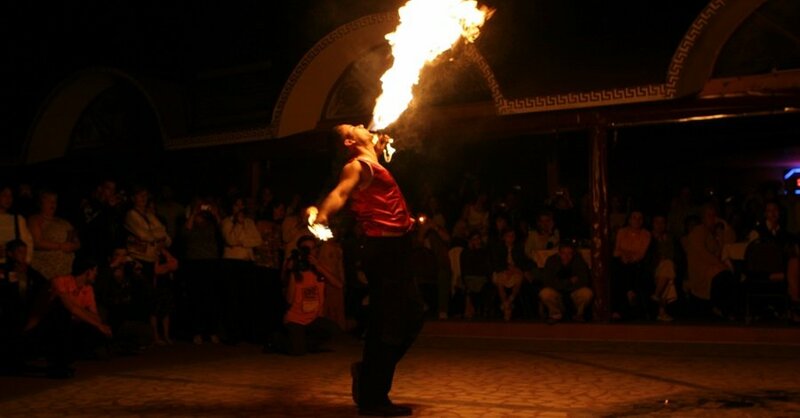 Icmeler Turkish Night show lasts for four hours and it is more than enough time for you to get familiar to numerous interesting aspects of Turkish culture, because the best way of learning things about other culture is through food, drinks, customs, and dance. Turkish Night in Icmeler will provide you with all the necessary ingredients to learn more about Turkish culture. Make sure to bring your camera, so you can capture all of the magnificent moments during shows. 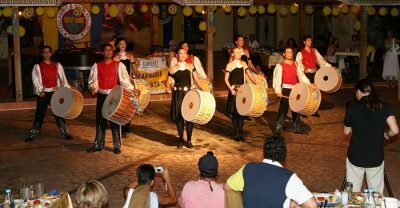 Price is all inclusive and includes Turkish Night Show, unlimited soft and alcoholic drinks as well as food served as dinner (chicken meat, rice instead of the bread, salad made of season vegetables, meze or cold starters, and season fruits). Price also includes full insurance and hotel transfer. There is no dress code and there are no restrictions. So what are you waiting for? Grab someone by the hand and go to a traditional Turkish Night in the beautiful city of Icmeler. You will have a memorable experience and some amazing fun. Authentic Icmeler Turkish Night show starts with a free pick-up from your hotel at about 19.30. After a short and cozy drive, we arrive at the Kervansaray which is famous for being the heart of Turkish nights life. 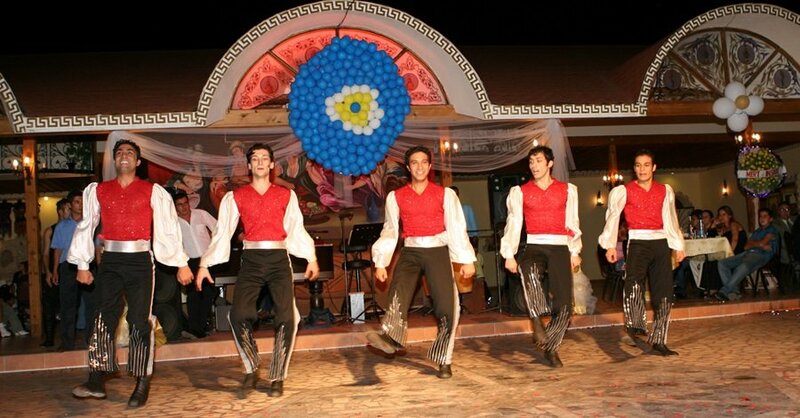 The show starts as soon as we arrive at Kervensaray, and the best part of the Turkish Night show are the dances. You will get to watch various different Turkish folk dances. 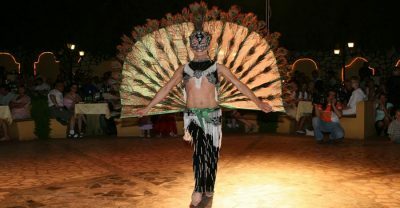 You probably already know about the world-famous belly dance, which is one of the integral parts of the Turkish tradition. In this lovely and unique Turkish atmosphere, belly dance will be performed by solely the best Turkish dancers. You will also get to see the recreation of a traditional Turkish wedding ceremony, see some of the most lavish costumes and hear some great tunes performed by folk musicians from Anatolia. 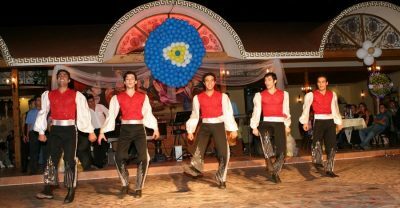 During the show, our polite and welcoming staff will serve you a tasty and traditional dinner with Turkish meze’s and other cold starters followed by chicken, rice and salads as the main course. You will also be able to taste unlimited supplies of local wine, beer and soft drinks with this rich and flavorful food. All of this is included in the tour price. 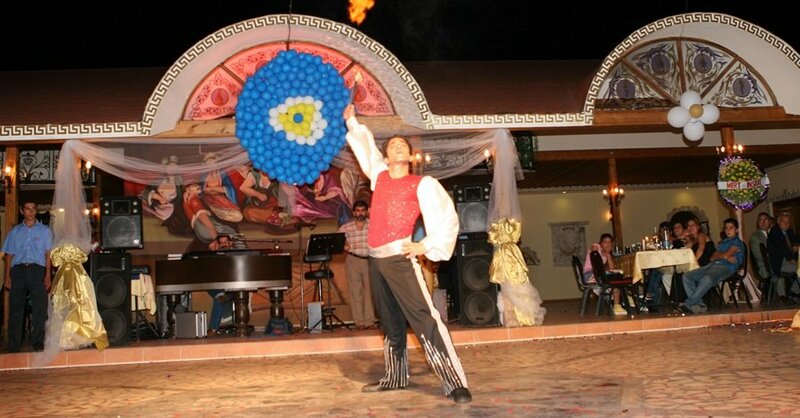 The Traditional Turkish Wedding Ceremony is one of the most popular parts of the night show. 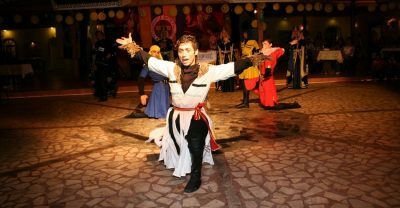 It includes belly dances and other folk performances, and it is a true treat because it gives the foreigners a fresh perspective of Turkish culture and customs. The most interesting parts of the Wedding show are shaving of the groom and the henna night of the bride. 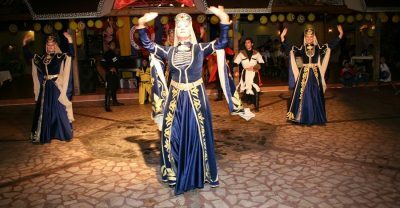 Kervansaray truly has numerous attractions to offer to its guests, but the most popular one is definitely the belly dance. 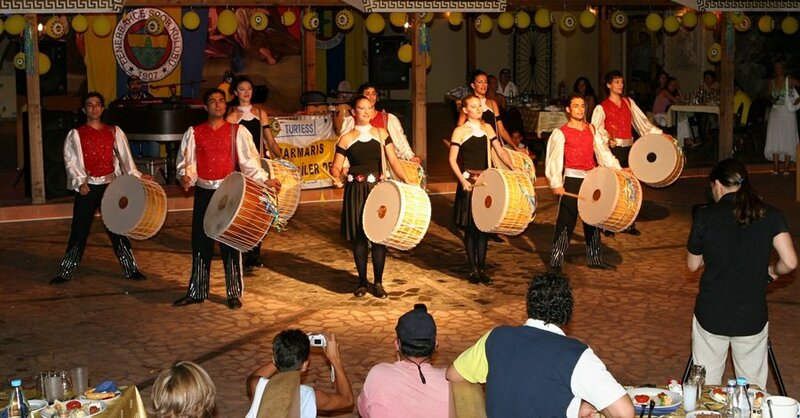 Skillful dancers also try to get those bolder among you to join them in this beautiful dance. There is also a male belly dancer, which comes as a surprise to most people! After the show ends at about 23.30, our driver will pick you up and take you back to your hotel. This transfer is also free of any extra charge, as it is included in the tour place. While you are in town, Icmeler Turkish Bath is something shouldn’t be missed.